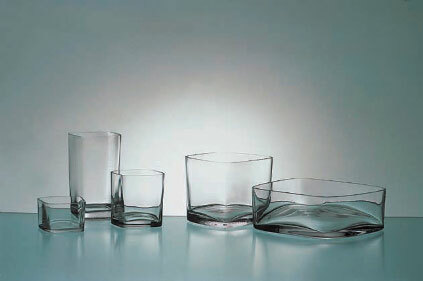 was developed as a commission for Sarner Cristal in Thun, Switzerland. The irregular outlines of the rim of these shapes are drawn by hand, not using a computer program. This allowes for a more human organic shape, that also change the way the sides of the shapes tilt. 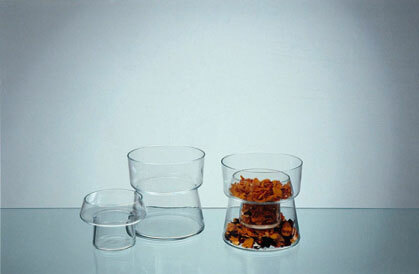 The range consists of multifunctional bowls and vases that are mouthblown in crystal glass. The breif for this vase design for the same company was to create a vase for the typical small but wide Swiss flower bouquets commonly given as gifts. As these bouquets often vary in size, this vase consists of two parts that are used either combined or apart as separate vases. It allows larger as well as smaller bouquets.